London Fashion Week had no shortage of big names for its SS17 outing. From Burberry, who introduced its show now, buy now Makers Space to Versus, which saw Donatella Versace bring out an army of sporty supers, there were plenty of VIP moments. But what keeps us coming back to London is that out of the traditional fashion capitals, it’s still the most experimental (it is held in a Soho car park, after all) and somewhere young talents have a chance to shine. With new names coming through every season, and independent names able to find their own spaces to make bold statements, LFW maintains its reputation as a hotbed of inspiration. Here are Nataal’s pick of this season’s upstarts and troublemakers kicking Brexit blues to the curb. Faustine Steinmetz is deeply wedded to denim. The French designer’s handcrafted approach, nurtured during her time at Central Saint Martins, elevates and reinvents this classic fabric into weird and wonderful concoctions, which for SS17 were worn by mermaid-like beauties with blue faces. Braded, shredded and deconstructed textures were paired with netted, see-through layers. Swarovski crystals and brash repeat logos festooned jackets and jeans incorporating Ikat weaving and hand printing techniques. Each indigo siren reclined in rectangular alcoves along a blue-lit tunnel for the duration of the presentation, creating an eerie and enchanting mise en scène. Nataal emerged having willingly thrown ourselves at their fluffy-slippered feet. Italian designer Serafina Sama has been quietly evolving Isa Arfen (an anagram of her name) since 2011 with her playful shapes and moreish fabrications. Her SS17 presentation welcomed us into a girl’s world where delightful young things went about a series of leisurely and domestic pursuits – hanging up washing, shelling peas, reading magazines, gossiping on the phone, arranging flowers and doing each other’s hair. But the everyday was far from her inspiration. “The raw beauty of the body painting and decoration of the Omo Valley tribes, the elegance and femininity of Seydou Keita’s 1950s and early 1960s portraits of Malian women and a humorous dose of early Nineties ethnic chic,” were among her reference points for this series of off-beat silhouettes. Rain coats, cropped trousers, knotted tops and sun dresses with cut outs came in shades of tangerine, ochre, powder and smoke. Painterly prints, tapestry jacquard, soft cottons and linen crepe added to the undone, poetic nature of the season. 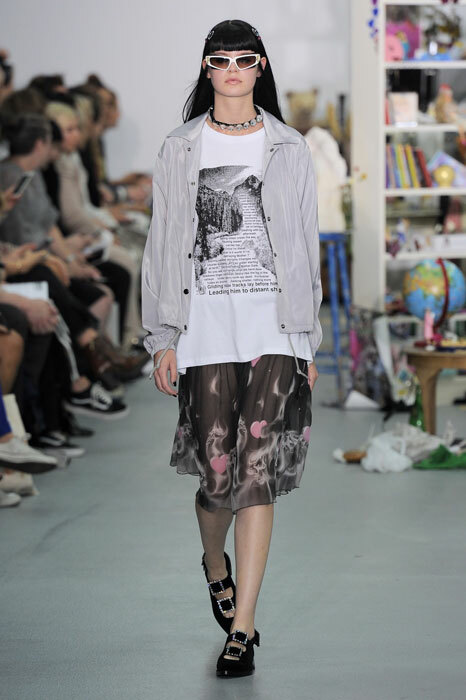 Paula Knorr made her LFW debut as the latest NEWGEN recipient with the deeply personal collection, All Of Me. Fittingly presented at the ICA, the recent Royal College of Art MA graduate started off by sketching and painting self portraits, and then translating these into abstract prints and heavy embroideries that evoke womanhood. “It’s about female sexuality, its fluidity and powerful emotions,” the German-born designer says. “Clothing and its wearer should be synergetic, a celebration of the woman’s personality and the nuances that make her unique.” Her models stood tall against blood red backdrops wearing body conscious silhouettes such as satin turtlenecks and metallic dresses that clung hungrily to curves. Leather trousers with wide ruffles gave their wearer wings while relaxed tailoring centred the presentation with earthy hues. Omer Asim always looks to both his Sudanese heritage and architectural training for his designs. His minimal, artistic approach is attracted to the stark qualities of black and white and to clean forms with authentic undertones. For SS17, entitled Reversed Sensory, tunics, waistcoats, loose trousers and tight tops were covered in paint marks and either seemed to hover independently from the body, or be held in place with solid breast plates. His long-term collaborator, jewellery designer Maya Antoun, created brutal copper accessories including mouth stoppers, rod broaches and ear spheres that added to the ominous air of the presentation for which models’ fingers and feet were also besmirched in black. Ryan Lo is never one to hold back on his fantasies and this season they ran from magic carpet rides and snake charmers to Venetian jesters and Cantonese cartoons. The Hong Kong-born Fashion East alumni threw everything into his candy coloured dress up box. And out came Elephant prints, maribou feathers, bows, lace, frills, lurex and harlequin knits on girly jumpsuits, dresses and shorts. And just to be sure the frou-frou was pushed to the max, Lo added huge pirate hats by legendary milliner Stephen Jones. More is more is more. School drop out took on prom queen for Ashley Williams' teen dream show. 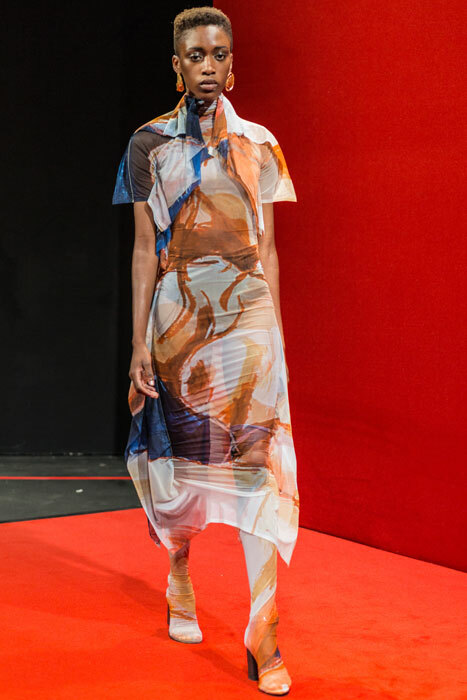 The British designer, who gradated from Westminster College to Fashion East before setting out on her own, covered the catwalk in teddy bears and balloons, which her girl squad marched past in a mix of tomboy and pretty pieces. Hoodies and dungarees contrasted with frilled shirtdresses (as worn decisively by Adwoa Aboah) and taffeta puff ball dresses. Pyjama suits and a t-shirt dress with an image of heartthrob River Phoenix on the front harked back to innocent sleepover antics circa 1986. However slogans such as First Born and a recurring cherub motif on varsity jackets and suiting hinted that actually, butter wouldn’t melt in these rebels’ mouths. Sparkly buckles, bunny bags and wrap around sunglasses readied them for detention.